Few things stay the same as we age, and our nutritional needs are no different. Nutrition as we age plays a key role in our quality of life. As we get older, certain body changes increase the risk of nutritional deficiencies that can affect all areas of health, including physical, mental, and social health. Providing your body with the right nutrients and maintaining a healthy weight as you get older can help you stay active and independent. It can also help you improve and even prevent symptoms of chronic conditions, like diabetes or heart disease. Let’s take a look at the ways that our nutritional needs change as we get older—and how caregivers can help their loved ones meet those needs. It’s no secret that our bodies change over time. But there are often more changes taking place than meet the eye. But what does that look like for seniors? That is, what kinds of foods—and how much of those foods—should seniors be consuming? Not Sure If Your Loved One Is Getting the Right Nutrients? Changing nutritional needs don’t have to be overwhelming—Senior LIFE is here to help seniors navigate those needs. Because our nutritional needs change as we get older, the types and quantities of foods we eat will need to change, too. Choosing healthy foods is key to getting the nutrients you need. And fortunately, figuring out which foods to eat—and how much of them—has gotten easier in recent years. Gone are the days of the food pyramid guiding our food choices. The USDA now recommends using their relatively new tool, MyPlate, to learn how your plate should look based on your age and other factors. The AARP has done one even better: The organization specially made a MyPlate for Older Adults. In addition, the Dietary Guidelines recommend no more than 5 to 8 teaspoons of oils—and only “small” amounts of salt, solid fats, and added sugars—each day. It can be hard to make sense of the various nutritional changes as we age. Caregivers can help aging loved ones navigate those changes in a number of ways. Planning healthy meals—Following the above guidelines, you can make sure that your aging relative is eating the appropriate foods, as well as the right amounts. Making meal-time a social event—Meals are a great way to gather with loved ones and socialize. Ask your loved one’s family members or friends over for lunch. Another option is to take advantage of our through-the-door transportation services to take your loved one to the Senior LIFE Center, where members can dine together over provided, senior-friendly meals and snacks. Talking with your loved one’s doctor—Because nutritional deficiencies are common among seniors, some need to take vitamins or dietary supplements to ensure they’re getting the necessary daily nutrients. Ask your loved one’s doctor whether vitamins and/or supplements are needed. And, finally, caregivers can help their loved ones with their nutritional needs by partnering with our Senior LIFE team. At Senior LIFE, we understand that it can be hard to make sense of the many different nutritional needs as we age. That’s why we offer nutritional counseling services to help members understand and manage those needs. 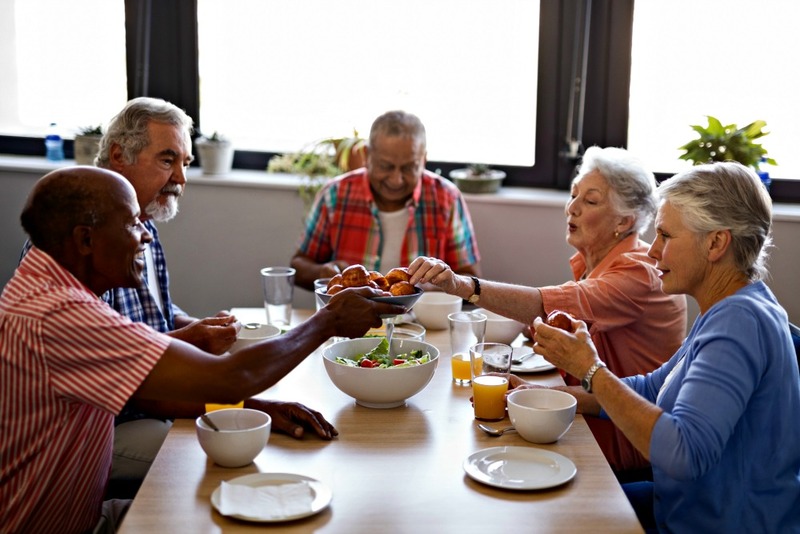 Our team of providers is specially trained in the unique dietary needs of seniors. As part of that team, a registered dietitian provides members with nutritional counseling and diet planning, based on their individual needs and medical conditions—such as diabetes and hypertension. At Senior LIFE, our specially trained team helps members understand their changing dietary needs through nutritional counseling. To learn more about the benefits of the LIFE program or to get started, call the Senior LIFE location nearest to you or 1-877-998-LIFE (5433).